Head west out of London Bridge Station. 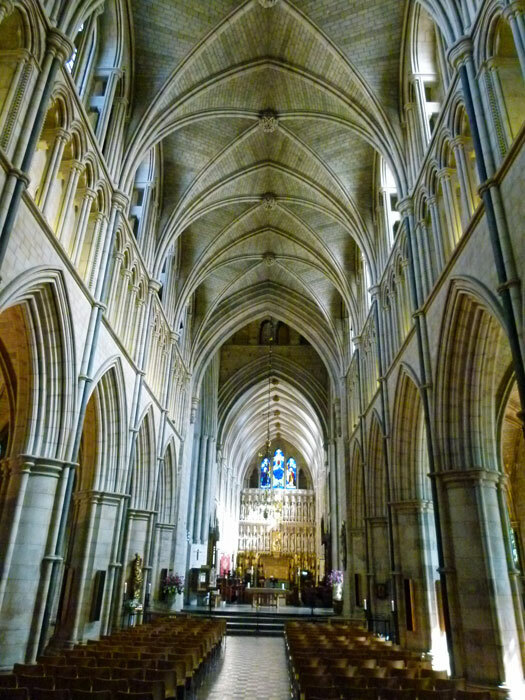 If you’re very careful, you will discover London’s third Anglican cathedral, Southwark; it’s easily missed. Hemmed in between the colourful and vibrant Borough Market and the occasionally vulgar Montagu Close, and often hidden by dark Victorian railway arches over which trains ceaselessly rattle and clunk in and out of the station, Southwark Cathedral does not stand out until you’re almost on top of it. But it offers a grand oasis of peace in this busy and historic part of London. Moreover, unlike its better known buddies, Westminster Abbey and St Paul’s, Southwark Cathedral won’t set you back the price of a reasonable lunch just to look around it. Southwark – particularly the part known as ‘Bankside’ – was always the dodgy part of town, outside the mainstream of the mercantile hub of the City of London, or the court at Westminster. This was the place for brothels and taverns – the Tabard Inn, from which Chaucer’s pilgrims set off on their way to immortal fame in ‘the Canterbury Tales’, was just down the road. Southwark was a place of entertainment – in Tudor times, all classes would come to watch bear-baiting, or perhaps go to the theatre. Shakespeare’s Globe was built a short distance away in 1559; its replica opened in 1997 not far from the site of the original. Shakespeare is commemorated in the cathedral – as is Sam Wanamaker (1919-1993), the American actor who was the driving force behind the New Globe. Indeed, Shakespeare’s brother, Edmund, was buried somewhere in the cathedral – though we don’t know where (someone lost the plot). Dickens has associations with Southwark – his father was in Marshalsea Debtors Prison (where ‘Little Dorrit’ was born) and, indeed, you might use Nancy’s Steps (where the fictional Bill Sikes reputedly murdered Nancy) on your way to or from the cathedral. While we’re name-dropping, my American reader may like to know that John Harvard, who has a college or something named after him somewhere or other, was born in Southwark in 1607, and baptised in the cathedral – where he has an entire chapel dedicated to him. So all of life is all around you. There’s a fascinating piece of excavation exposed on the external north east corner of Southwark Cathedral, showing layers of time stripped away, revealing the past – 17th century kiln, 12th century wall, Roman road. There was a Roman settlement here, south of the major town of Londinium. The road led to London Bridge – until 1729 the only bridge crossing the Thames east of Kingston, 13 miles away. The Saxons called this district Sudwerca – ‘southern defence works’ and, before that, Suthriganaweorc – ‘fort of the men of Surrey’. Before any of them came, it was an area of mud flats. 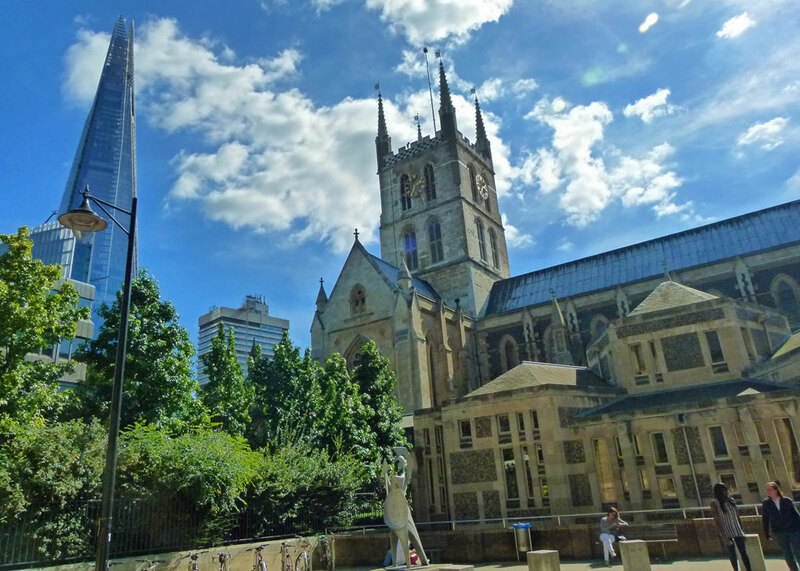 Actually, Southwark is relatively recent as cathedrals go. 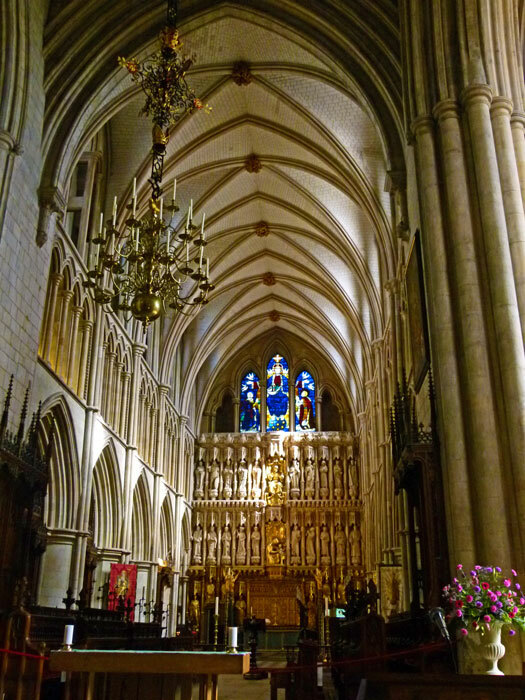 Though the oldest part of the building dates from 1220, making it the earliest Gothic church in London, it only became the cathedral for the new diocese of Southwark in 1905. There’s a traditional claim that the roots of the place date back to a 7th century nunnery founded by Mary, an enterprising daughter of the local ferryman, using profits from her dad’s business. What really happened is shrouded in the mists of time, but it is a fact that from 1106–1538 St Mary Overie (over the water) was the church of the Augustinian Priory of Southwark, under the patronage of the Bishops of Winchester whose palace was a few steps away. The monks built a hospital next door to their church, called St Thomas’s in honour of St Thomas a Becket; Guys and St Thomas Hospital is now one of the largest hospitals in London. When the monastery was dissolved in 1539, the church became the property of the crown and was re-dedicated as St Saviour’s. Henry VIII, that well-known opportunist, rented it to the congregation, though the parishioners raised £800 to buy it for themselves in 1611. By 19th century, the church was in a state of disrepair and much of its survival is due to extensive Victorian restoration. A wooden effigy of a knight, in full armour, which is thought to date from around 1280. It’s impressive enough to see a 700 year old stone sculpture – but wood?! And the detail is astonishing – looking into a face from so long ago is quite disturbing. 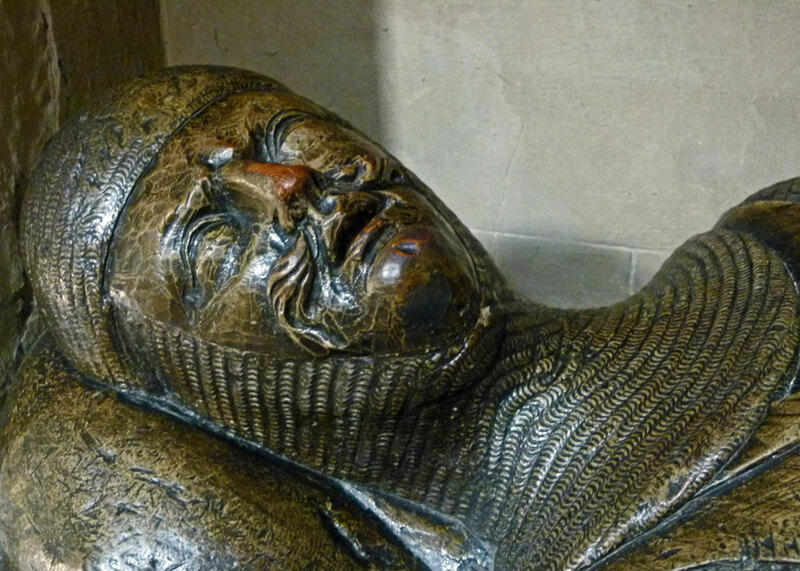 No one knows for sure who the knight was, though it is possible he was a member of the powerful de Warenne family, which included the Earls of Surrey. 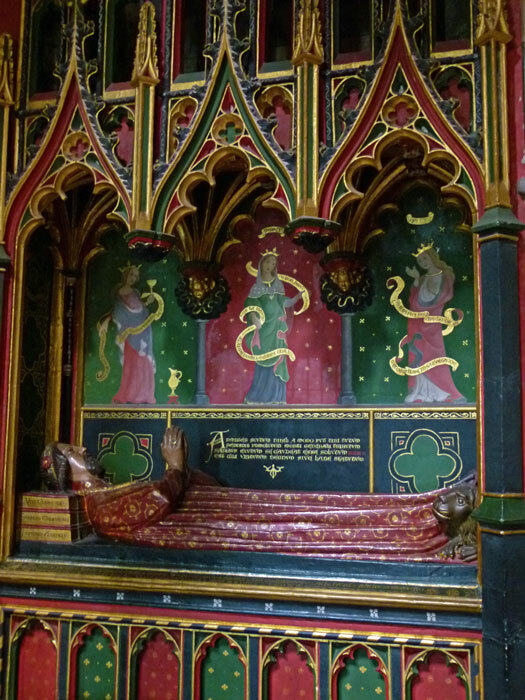 The tomb of John Gower, 14th century poet to King Richard II and King Henry IV, who died in 1408 and who was a friend of Geoffrey Chaucer’s. 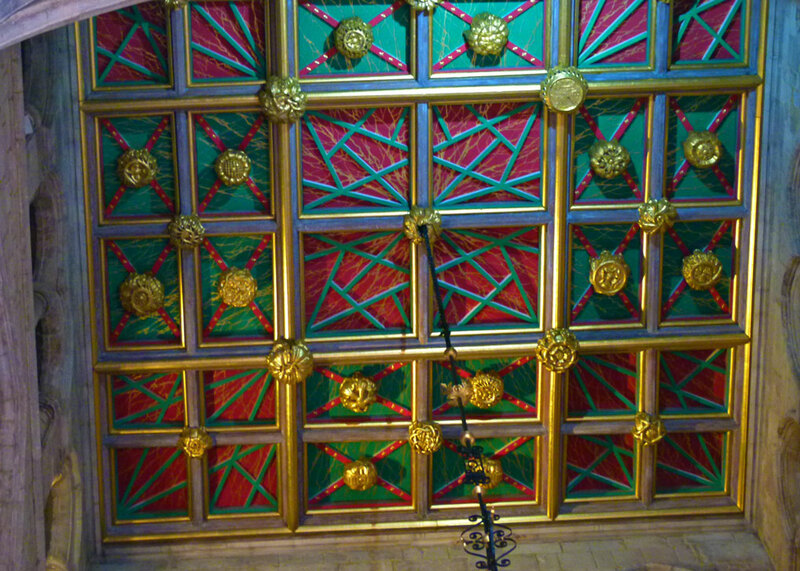 The colours are particularly rich – a reminder of the time when the interior of the church would also have been highly decorated. The tomb of Bishop Lancelot Andrewes (1555-1626) – one of the most brilliant men of his time who, amongst other achievements, oversaw the translation and production of the King James, or ‘authorised’ version of the Bible. So, not only a clever man but also one whose work is still with us. And his mortal remains are in Southwark. The incredible altar screen, depicting saints and people associated with the Cathedral, which dates from 1520. It is simply beautiful. A ‘nonsuch’ chest, made by German immigrants in Southwark in around 1588. 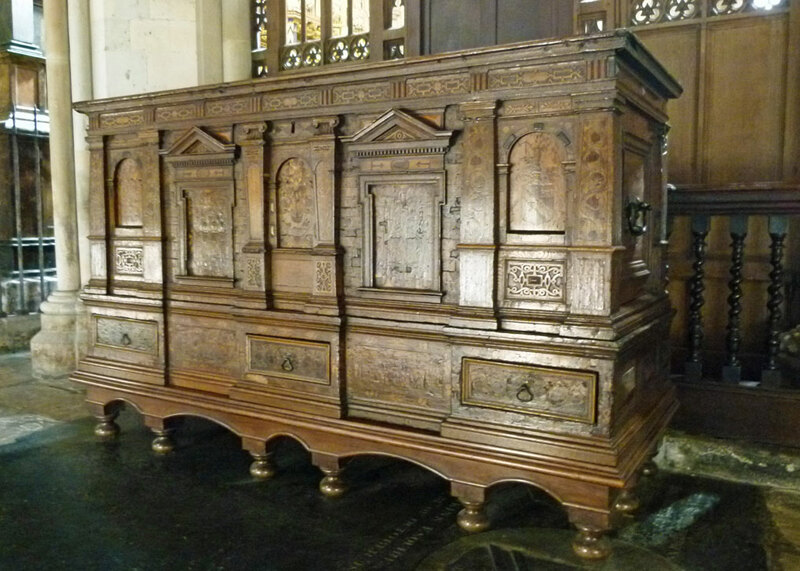 Nonsuch chests were quite popular in the 16th and 17th centuries – they were highly ornate and possibly named after Nonsuch Palace, Henry VIII’s flamboyant pile near Ewell, or in this case perhaps after a highly decorated house that used to stand at the southern end of London Bridge. After all that, I should add that the cathedral refectory offers the heavenly promise of a cup of tea. 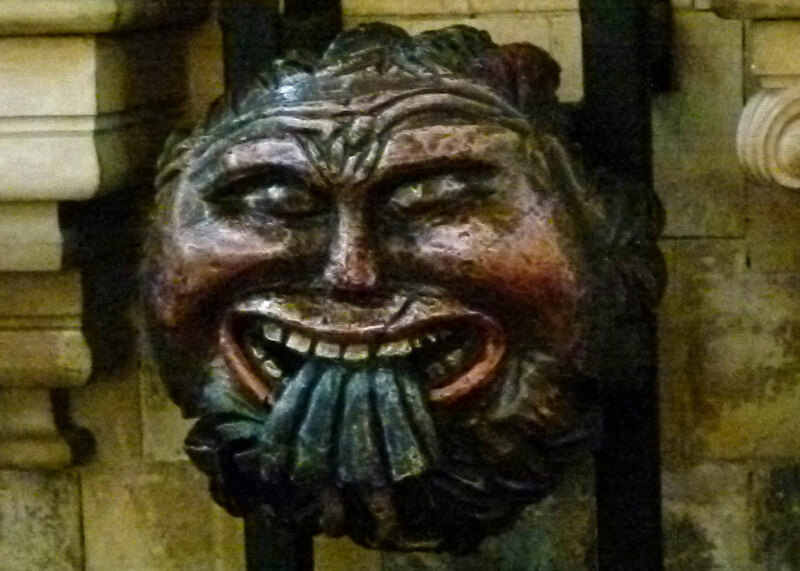 Go to A Bit About Britain’s attraction directory to see the entry for Southwark Cathedral and to discover other churches to visit. really interesting thanks, I’ve been there but I haven’t been inside. Did you see the excavations on the outside with the different eras of stonework labelled? Hey – thanks for dropping by. Yes – it’s mentioned in the post. Go inside next time you’re over – though there’s so much to see/do in that part of London! Well done. Was just there 10 days ago with son-of-C. We also find this so calming in the center of a busy place. After leaving the Cathedral, it’s just a short walk through the Market to reach the George, which can also be ‘calming’. Great post. Thank you, Mr C. That part of London is great for exploring – as you know! Sounds like a nice cathedral. I like it when are actually peaceful places. We’re planning a couple of days in the Smoke in October and now I have a few places I’d like to see when we do. (We’re going primarily to see the museum of the Order of St John. Mr Anorak and I both have connections to the organisation.) Southwark might be part of a new plan. I enjoyed your tour of the cathedral and recalling memories of my visits there. I would like to walk into such a place to the sound of sublime music! Have enjoyed your posts about Southwark. We too visited the Cathedral and the Clink. And I was most pleased to find a small plaque dedicated to Oscar Hammerstein and also a stained glass window for Samuel Johnson! Do you know where the wooden cross in the courtyard? I have not been able to find out any information on it. 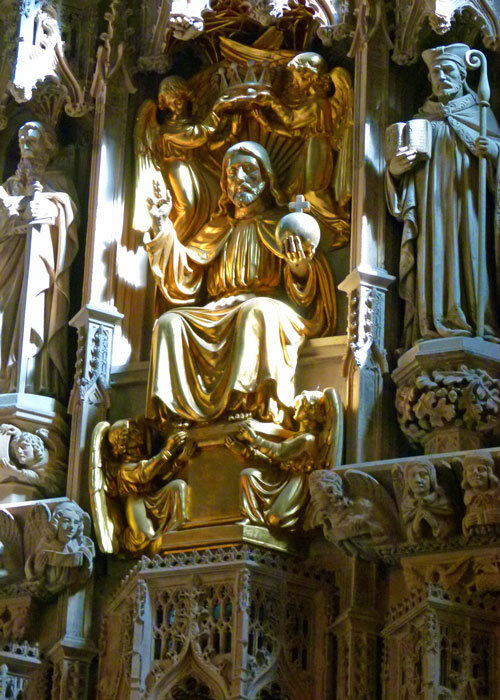 Great post on Southwark Cathedral, by the way! We hope to see it later this year! It is strange to go past it at roof-top level on the train! A beautiful cathedral. My elder daughter visited it as part of her MA degree. This looks like a really interesting church/cathedral to visit. I agree with you cathedrals/churches have completely different atmospheres from each other. The atmosphere in Winchester Cathedral drew me back for second lingering visit when I stayed in Winchester. Nonsuch is a new term to me. What a beautiful place this is. ‘Nonsuch’, as you’ve probably guessed, simply meant ‘none such as this’ – or ‘unrivalled’. Its a really fascinating place, and one to visit no doubt. Thanks for sharing!